A couple months ago I bought the book Artisan Bread in Five Minutes a Day. It’s nigh onto life changing. Have you ever looked at the clock and realized it’s 5:00 and you were going to make a loaf of crusty bread for supper but now it’s too late? Never again. Have you ever wished you could have really good homemade pizza at home but didn’t want to knead bread forever, and didn’t start no-knead pizza dough the night before? No problem. Wish you could serve homemade yeast rolls to the family for supper tonight without calling on Sister Shubert? Done. This is such an easy solution that it’s almost ridiculous: keep dough in the fridge. The end. It takes five minutes to mix it up, and keeps for two weeks. So what are you waiting for? *If you’ve been straining yogurt and have some whey left you can use whey in place of water — a great way to add some protein and a little sourdough-like tang to the bread. Mix all that together with a dough whisk, a wooden spoon, a mixer, or whatever. No kneading — you just want everything to be well combined. Put it in a container that’s not quite airtight: this 14 cup produce container with the insert removed is perfect for a half portion of the recipe, and is designed to let produce breathe a bit, so it’s become my designated dough container. After two hours at room temperature, move it to the fridge to chill. Now go bread crazy! I use the dough for pizza, for crusty bread, for buttery dinner rolls, for hamburger buns, even monkey bread! Maybe some barbecue chicken pizza? 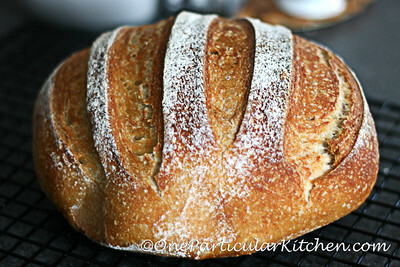 Dust a little flour on a corner of your chilled dough and pull off a piece as big as you need. Shape it into a ball and let it rise for at least half an hour, but an hour is great if you have the time. Then bake and enjoy! No harder than cracking open a tube of bread with questionable ingredients, and worlds healthier. Most configurations of the dough will do great at 400 degrees in the oven. Baking time will obviously depend on the size of the bread, but you want the internal temp to be about 190 degrees and the bread to be nicely browned. I really do recommend picking up the book. It has many different variations of the recipe, and many uses for each recipe. It’s about $17 at Amazon right now, and well worth the price. Enjoy it, and let me know what you make with it! I’m definitely going to check out that book – thanks for the tips and for introducing me to such an indispensable cookbook! Oh! My! We love freshly baked bread in this house and regularly settle for par-baked ficcelli loaves from Trader Joe’s. (Pop-in-the-oven-easy) But this! This is such a perfect solution. I am printing out the recipe right now and going downstairs to make this. My kids will have a ball helping! I LOVE this book and have pre-ordered the new one due out in the Fall! Thanks for the half-recipe – for some reason never thought to do this. Oh yes. Artisan Bread in Five Minutes is heaven sent. This was our article for the Tampa Tribune, published a few months ago. The authors are fab. so, i’m a bread rookie, but what kind of yeast do we use? proofed or no? I use only bread machine yeast — the kind in the little jar in the grocery store. It’s instant, so no proofing required. Quick and easy! You can TOTALLY make this bread, I swear. Let me know how it goes! That is almost exact to my recipe and mine never looks like that. We need to get together some time and put up something… anything so we can cook and be moms together. used the bread machine yeast, turned out great, i actually forgot about it while it was rising, but it was still ok, had almost a sourdough taste. this morning i used it to make bagels, turned out delish! I have a half & half premixed white & whole wheat flour. Do you think the addition of the whole wheat will mess this recipe up? Not a bit! I do that all the time. Pingback: Pizza Rolls – So, How's It Taste?